After Israeli forces shot her 15-year-old cousin in the head with a rubber bullet last December, Ahed Tamimi, a Palestinian girl from Nabi Saleh in the West Bank, stood up to the occupying Israeli forces and was arrested and charged for slapping a soldier. The story of the activist went viral. But what Ahed was fighting for was largely buried beneath sensationalized media representations of her. 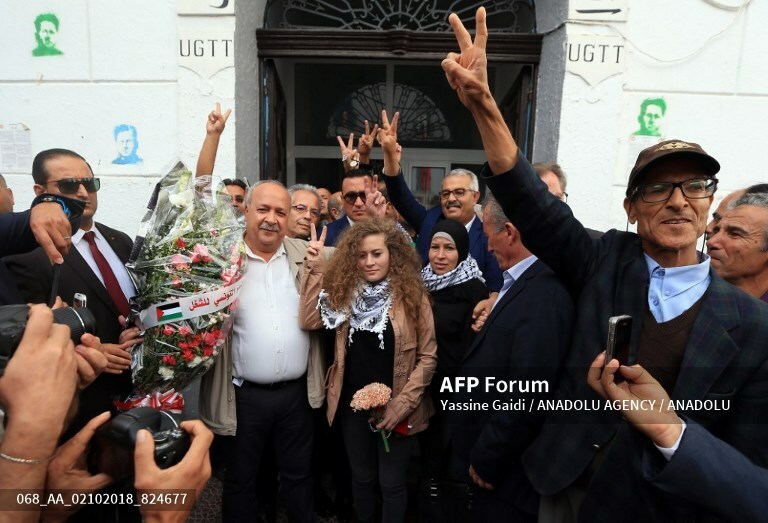 ISTANBUL, TURKEY – OCTOBER 25: Palestinian resistance icon Ahed al-Tamimi, poses during an exclusive interview as she arrives in Istanbul to attend the 3rd General Assembly of Islamic Conference Youth Forum for Dialogue and Cooperation (ICYF-DC), on October 25, 2018. Onur Coban / Anadolu Agency. ONUR COBAN / ANADOLU AGENCY via AFP. Her story is unlikely to circulate in the same elevated spaces granted to Malala Yousafzai, the Pakistani girl who survived a brutal attack on her school by the Taliban, even though both Ahed and Malala are fighting for similar rights and freedoms. Both are young women facing down brutal military repression at the hands of fully-armed men, yet their stories could not have been received more differently. The reasons for our complicated responses to Malala and Ahed’s stories are as multi-layered as the political realities that shape their lives. They encapsulate a range of ideas about gender and the girl-child, nationalism and education, and about forms of activism that are palatable and therefore deemed legitimate and those which are not. Both Malala and Ahed refuse to be victims. Malala has dedicated her life to advocating for girls’ education. Her story helps to send powerful and inspiring messages to girls around the world — girls like Ahed, who dream of being a lawyer. Ahed turned the Israeli female prison unit where she was held into a school, where she and other incarcerated Palestinian women read and studied legal texts. But Malala’s platform also has the contours of a story that can buttress imperialist worldviews and justify militarized interventions in Asia. The use of rhetoric about saving women and children in the Middle East by politicians is one of the ways that liberalism appeals to Western emotions to garner support for the U.S. led “War on Terror,” as the scholar Maya Mikdashi writes. 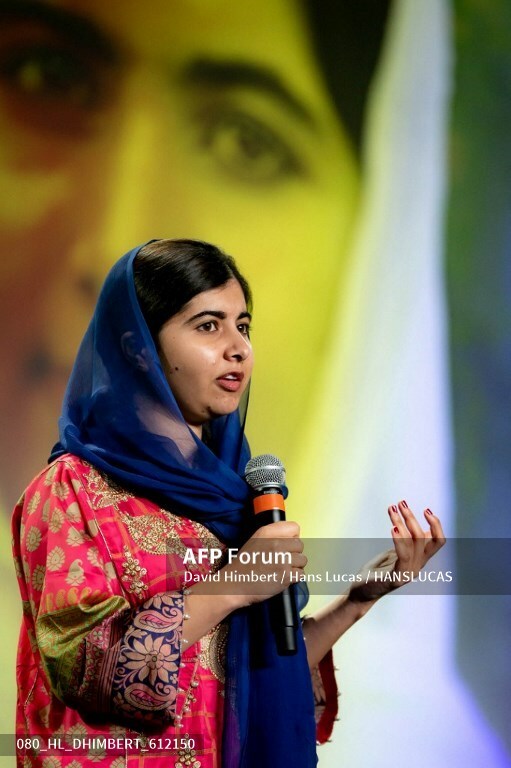 Activist and Nobel Peace Prize laureate Malala Yousufzai, at a conference on education given in Montreal on September 26, 2018. David Himbert / Hans Lucas via AFP. Ahed is too empowered, too unmanageable and altogether too adulterated by her community’s struggle to appeal widely to liberal sympathies in the West. She is also too blonde, according to U.K. Prof. Yosefa Loshitzky. Loshitzky characterizes Ahed as someone who completely disrupts the gendered and racial logics of the Israeli occupation. The point isn’t that Malala doesn’t deserve the platform she’s been given, but that while we celebrate Malala’s advocacy for girls’ education, we must ask why that platform is not extended to children like Ahed. Anything less is a disservice to them both. Malala’s status as a worthy cause has a critical relationship to Ahed’s status as an exception to that cause. The differences between the reception of Malala and Ahed in the global cultural marketplace illustrate this point in fairly stark terms: Malala’s activism wins her the Nobel Prize, and takes her to Oxford, while Ahed’s activism landed her in an Israeli prison. Yassine Gaidi / ANADOLU AGENCY via AFP. Whether the Obama administration would have had the political courage to grant Ahed a visa is impossible to know. Obama’s gestures of support for Palestinians were largely superficial, while his financial support for the Israeli military was unwavering. By comparing Ahed and Malala, we come closer to understanding the limits and even the failure of liberal visions of social progress in the 21st century. Ahed is a classic case of how American liberalism’s blind spots breed discontent around the world. Malala’s advocacy circulates in a neoliberal economy in which much of the value of her story has become something that communicates the power of the individual to overcome extreme hardship and to effect social change against an enemy long reviled by the West. In this transaction, the politics that underwrite her suffering are managed by focusing on her personal story of survival. In her story is redemption for the West, whose role in the violence that harmed her (and thousands of girls like her) is mitigated by their efforts to uplift her. In Malala’s story of fighting for the right to education, as a girl, the Western media and political machinary finds a story that chimes powerfully with arguments used to bolster the U.S. led military invasion of Afghanistan. In this sense, Malala’s message has been co-opted by the neoliberal idea that everyone can gain access to the same opportunities, so long as they follow the proper procedures. In her case, by fighting an enemy recognizable to us, Malala gains access to recognition, including entry to the oldest university in the country that colonized what is now Pakistan. 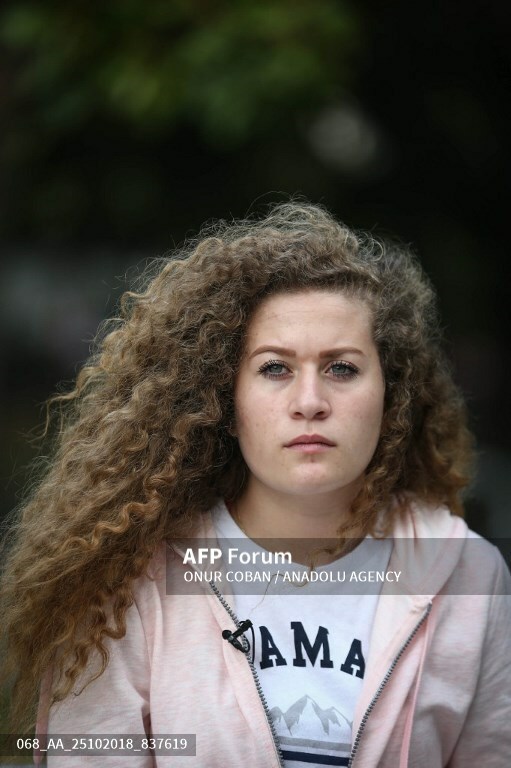 By contrast, Ahed cannot perform her suffering in ways that appeal to the paternalistic liberal imagination. Ahed’s story cannot be yoked to the Janus-faced work of neoliberalism, global development and military intervention. Ahed’s enemy — the Israeli army that maintains and deepens the illegal military occupation of her country — can rarely be recognized in dominant Western discussions without accusations of anti-Jewish sentiments. Stories like Ahed’s that insist on collective forms of liberation over individual liberation, draw our attention to diffuse and entrenched systems of oppression that cannot be remedied through individual acts of uplift. 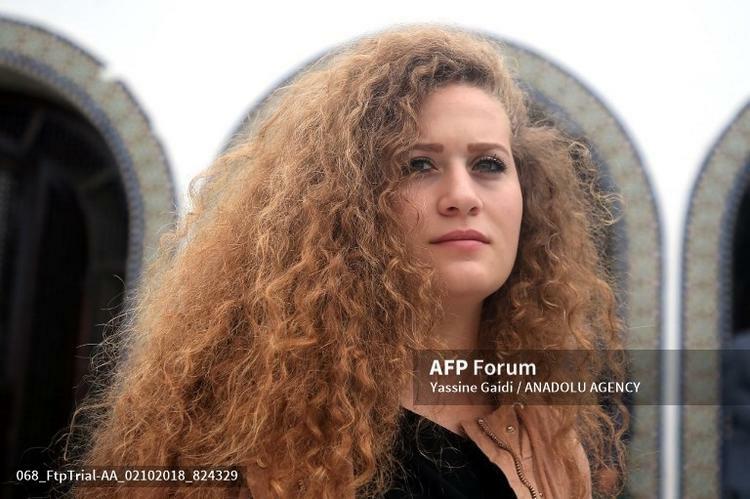 “There is no justice under occupation and this court is illegal,” Ahed told her prosecutors, as she smiled and the international media captured the scene for the world to see. Ahed’s smile in these photos unsettles liberal conceptions of suffering that separate the rights of the individual from their social, political and economic making. Wringing our hands and watching from the West, we are implicated in the sham of liberal justice.